The marathon of reviews continues with another Born Pretty pretty. There's plenty of pretty out there in nail world, but nothing feels quite as pretty as a girly bow. Okay...maybe pink, scented, kitten shaped glitter would be prettier...or at least girlier. But bows are up there. At least top ten. 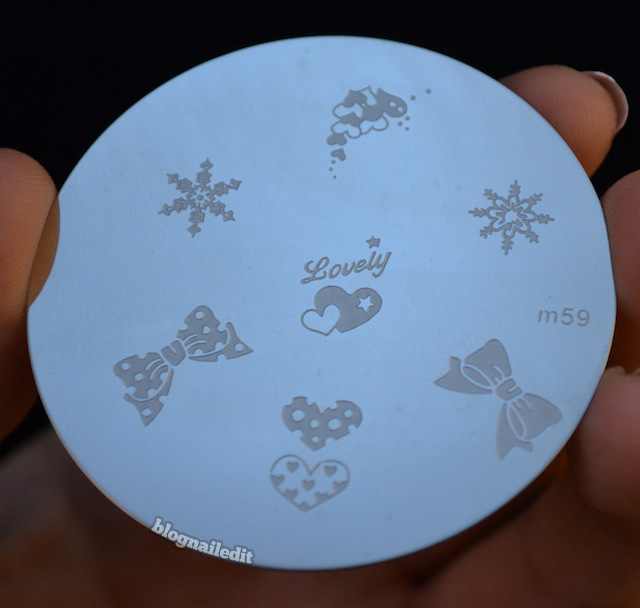 The m-59 plate is a great stamp if you're looking for bows. It comes with not one but two bows for you to choose from (and these aren't duplicates). It also gives you 4 different hearts to choose from and two different snow flakes. For this, it's one of those versatile but useable plates I'll come back to when I'm looking to quickly spice up a manicure. For this manicure using Light as Air and Sugar High (China Glaze), I just wanted to use the bow. Compared to my last experience with a Born Pretty plate, this was flawless. The designs are all carved deeply and with nice detail. I didn't have to retry anything to get the right results, and the plate fits nicely with the rest of my plates (Bundle Monster, Red Angel, Konad). If you're looking for a pretty plate, grab this one. It's cheap at $2.99 and the designs are all not only cute, but useable. When wouldn't you need a heart or a bow? And for winter, snowflakes can look amazing with some metallic polishes. Pick up your plate here and get free shipping. If you're looking to spend even less than $2.99, why not use a 10% off coupon? I just so happen to have one for you to use any time, as many times as you'd like! 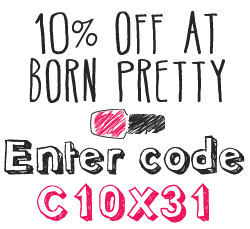 This product was sent to me by Born Pretty. The reviews are based entirely on my experience with the products and were in no way influenced by anyone. 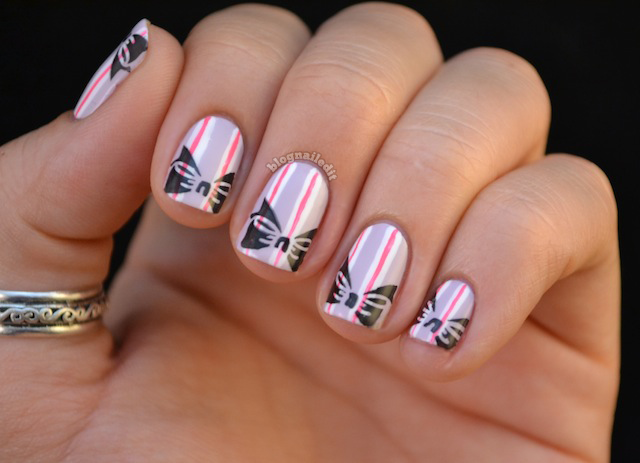 I love that you put the bow on top of stripes and not just on a solid color!